Cochrane Tobacco Addiction Group listen to stakeholders as part of their 20th anniversary celebrations. 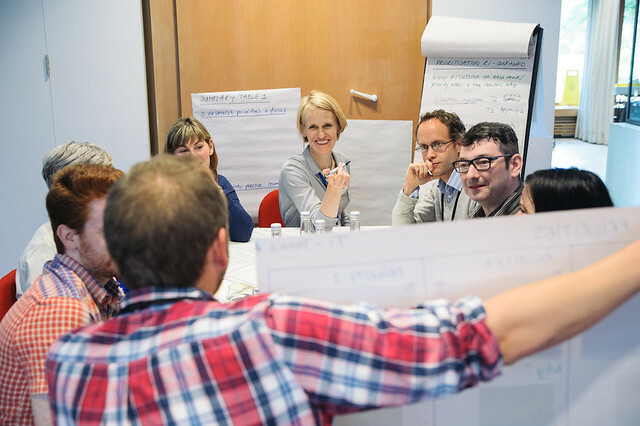 On Friday 17 June the Cochrane Tobacco Addiction Group hosted a stakeholder dialogue workshop to inform future research priorities for the group and the wider research community. The one-day workshop brought together CTAG editors with around 50 of their stakeholders including policy makers, health service providers and commissioners, clinicians, research funders, researchers and a large group of public representatives. The workshop followed a two-stage research prioritisation survey, which generated over 680 questions from more than 300 people, 183 of which are currently unanswered by research. The workshop set out to hone down these questions into a set of actionable priorities for the CTAG group and wider research community, as well as to develop new insights into how systematic reviews by the group can be better disseminated to inform policy and practice. At the end of the workshop, which was facilitated by dialogue consultants Hopkins van Mil, the workshop attendees highlighted 8 key research themes, with the final consensus exercise identifying “addressing inequalities” as the priority theme for future research. This includes questions such as supporting people in hard-to-reach and low socioeconomic groups to quit, and finding the most effective interventions and preventative strategies. The group aim to publish their final report of the “Twentieth Anniversary Priority Setting” project before the end of 2016 in a peer-reviewed journal, as well as an action plan for implementing the priorities into their future work. The project was funded by the National Institute of Health Research School for Primary Care Research.